(NaturalNews) The old saying "April showers bring May flowers" has never been more true, particularly in the Texas Hill Country, which has received its fair share of rainfall accompanied by hot and humid temperatures. Unfortunately, wildflowers aren't the only ones flourishing, as fleas and ticks also thrive in warm, moist environments. If you're a pet owner, and anything like me, you absolutely dread this time of year, as it's often the start of a long, arduous battle against fleas. As a reader of Natural News, you likely already ditched the chemical treatments long ago. However, despite knowing the dangers, I personally have still used chemical treatments to combat fleas in my two pet cats, mainly because giving them a pill is a lot easier, and I thought, more effective. However, the latter is proving to be less and less true, as pests grow increasingly resistant to these chemicals. In the past, I've tried several natural methods for combating fleas, including squeezing lemon juice all over my poor kitty. Needless to say, she did not appreciate that, and her discomfort was in vain, as the treatment did not work. However, thanks to Dr. Will Falconer, a homeopathic veterinarian located here in Central Texas, I'm proud to announce that I've finally stumbled upon some non-toxic methods that effectively control fleas and ticks without harming your pets. It's always good to brief yourself on how exactly the flea's life cycle works, as it's the vast number of eggs that are the most problematic. 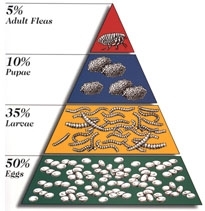 Adult-biting fleas constitute just 5 percent of the problem, while the eggs, laid both on and off your pet, make up 50 percent of the pyramid, explains Dr. Falconer. Larvae, making up 35 percent of the flea cycle, "emerge from the eggs and feed on debris and organic matter in carpets, soil, or in cracks and baseboards." Above that are the pupae, making up 10 percent of the flea's life cycle, which remains "suspended in a cocoon that seems impervious to all control efforts, natural or otherwise." The best way to kill fleas is to attack the base, targeting eggs and larvae, says Dr. Falconer, adding that most conventional treatments, which are poisonous to your pet, wrongfully target the adult fleas. Flea bombs, sprays and dips only lead to resistant fleas, and sick people and pets, says Dr. Falconer. "It's the same story that happens with any antibiotic, pesticide, or herbicide: a certain percentage of every population of 'pest' is resistant to any given chemical. When the chemical is used, these resistant microbes, parasites, or weeds breed and begin a new strain that simply ignores the chemical. New chemicals are sought that are increasingly less safe to the humans and animals they contact, and resistance develops at each new turn." 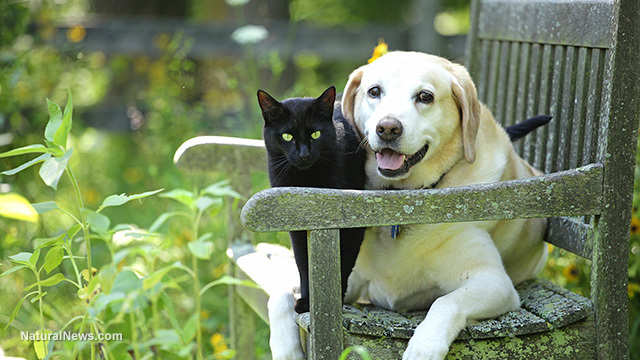 If you have your own yard, one of the best ways to manage fleas is to reduce their population outdoors. This can be done through "a biological control" called nematodes or tiny worms applied via lawn sprayer, that within 24 hours can decrease the number of flea larvae in soil by about 90 percent. Dr. Falconer advises that the worms be applied following a good rain, adding that "predators need to be reintroduced periodically, because they eat all the prey species and die off for lack of food." Nematodes can generally be found at your local pet or garden store; however, you can also purchase them here and here. Next, you'll want to tackle fleas indoors. If your home is mostly carpeted, you can get rid of flea larvae using boric acid products, which have limited toxicity to people and pets. These products, which are in powder form, work by being sprinkled onto your carpet and brushed in with a broom before vacuuming. Dr. Falconer says most applications are good for a year, but make sure not to inhale as it can irritate your lungs. For mostly bare floors, Dr. Falconer recommends Nylar, a "very safe chemical" that controls flea growth. Nylar should be applied anywhere your pet rests, including floors, kennels, bedding and furniture. "Its action is to prevent eggs from hatching and larvae from molting to adults. It does this by mimicking a juvenile hormone in the insect, and keeps the young from ever becoming adults. "Once-a-year application should be sufficient in most cases, unless floors or kennels are washed or exposed to rain. It is difficult to find this chemical alone. It is often combined with adulticides (read: poisons). So it becomes imperative for consumers to be label detectives." Using a good flea comb is one of the best ways to rid your pet of adult fleas, which may live for several weeks, says Dr. Falconer. You may also bathe your pet in the Health Ranger's Pet Shampoo or Dr. Bronner's soap, but be weary that frequent bathing is inadequate for controlling fleas, and it dries out your pet's coat. For dogs, you may add a few drops of essential oil to the bathtub, including lavender, citronella, tea tree or eucalyptus. This remedy doesn't work well for cats, as they're much more sensitive to essential oils, and can get sick from them. Lastly, another nontoxic treatment that can be used outdoors, inside the home, and on your pet is a natural cedar oil product from Wondercide, an Austin-based company that extracts the cedar oil from trees cleared here in Texas. "It turns out that cedar oil works well on both fleas and ticks (and yes, bedbugs), and is safe for the mammals, be they pets or human folk. It acts by interrupting the pheromones of these pests, which is the way they communicate and find their prey and their mates," says Dr. Falconer. Flea & Tick kills fleas and ticks, as well as acting as a pest repellent. Though it's recommended for cats and dogs, Dr. Falconer is a bit wary about using it on cats, as again, they're far more sensitive to essential oils. He recommends starting with a small area on the body, such as between the shoulders. If your cat shows no signs of discomfort within 12 hours, go ahead and apply to the rest of the body. My own personal experience using Flea & Tick goes as follows: one cat did just fine upon application, but the other not as well. My male kitty began drooling excessively after licking the cedar oil, and though he wasn't harmed, it just goes to show that pets will react differently. So, be sure to follow Dr. Falconer's advice about testing the product in a small area on cats first, preferably where they can't lick it off. The upside is that the product appears to work, and smells great. To learn more all-natural pet advice from Dr. Falconer, click here to sign up for his newsletter.